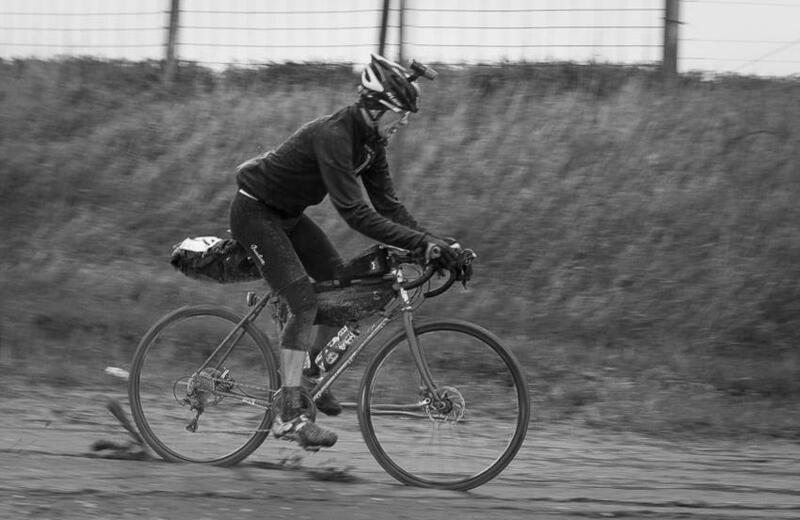 Gravel gits in yer shorts.. Just when I thought my 382 mile gravel-grinder last June was one of the last ones on the bucket-list, I go up and sign up for Trans-Iowa V11. 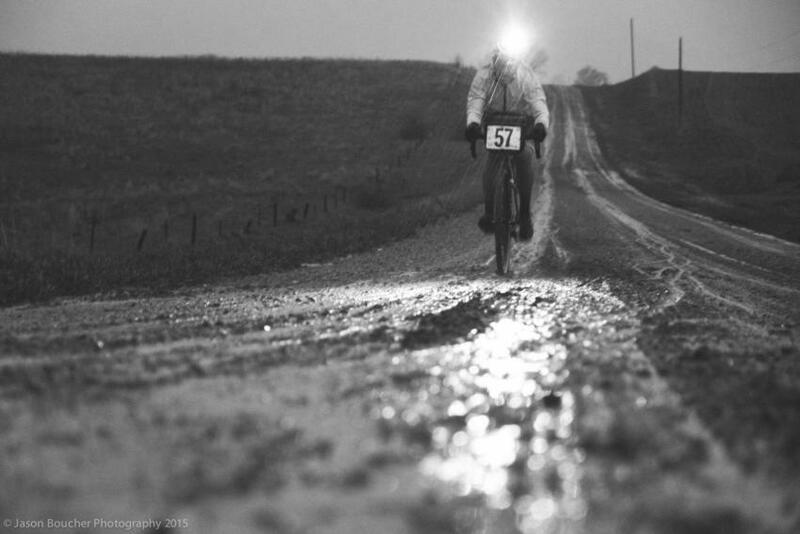 Trans-Iowa is grand-daddy of all gravel races. Similar to what RAGBRAI is to 'ride-across-the-state" rides. This year's Trans-Iowa had racers from Germany, Guatemala, British Columbia, New York, California, Colorado, many states in between and a nice core of Iowans. 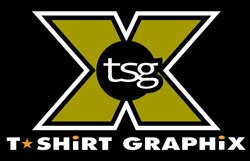 Trans-Iowa V11 (TIv11) started at 4 am on Saturday April 25th in Grinnell. It started and ended in Grinnell. TIv11 was announced back in early August 2014 and I signed up as a rookie in November. 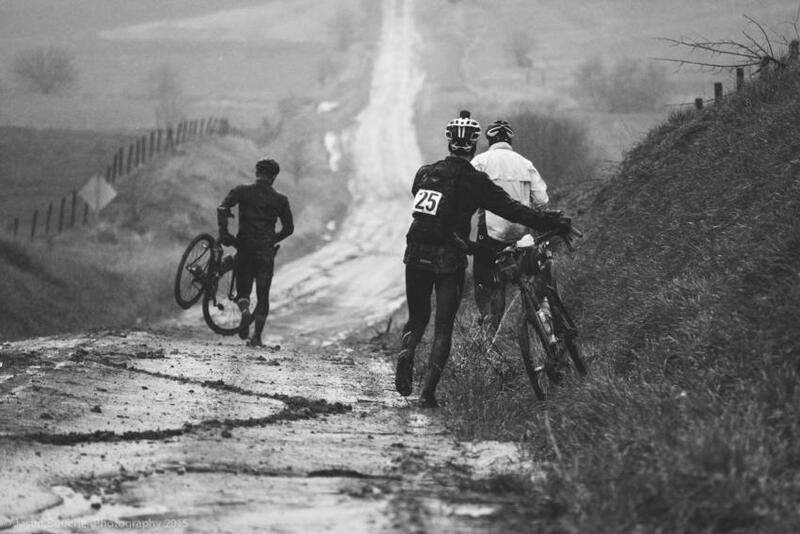 It was slated for 331.77 miles with a 34 hour cutoff and an estimated 18,000 feet of climb. I was one of 120 racers. 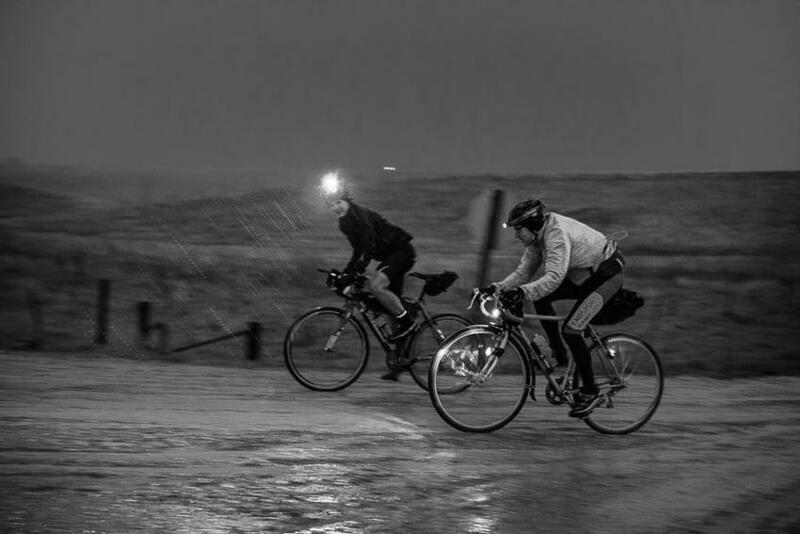 Just knowing you have signed up for a 330+ mile self-supported race early in the season will change your Winter training, riding and eating habits... I feel for the better. I spent lots more time outside on the fatbike and gravel than I ever have and I enjoyed it! We were all watching the weather forecast. It called for rain on Friday (before the race) and Saturday with clear skies on Sunday. On Friday the forecast turned for the worse and more rain and wind was predicted. Since this is a self-supported race, you must carry ALL your gear for a whole day, over night and then into the next afternoon. I took LOTS of extra gear to the race and figured I would make some last minute decisions based on the last minute weather forecast. We also knew that convenience stores would be no further than 90 miles apart, so that meant carrying quite a bit of food and water too. Race director Mark Stevenson calls this "Checkpoint 0" All racers meet up at the Grinnell Steakhouse to pick up race number, cook their own steak or chicken, talk with other gravel nerds and listen to a pre-race meeting. Mark said "This year would be a tough one. Mother Nature is the wild-card". 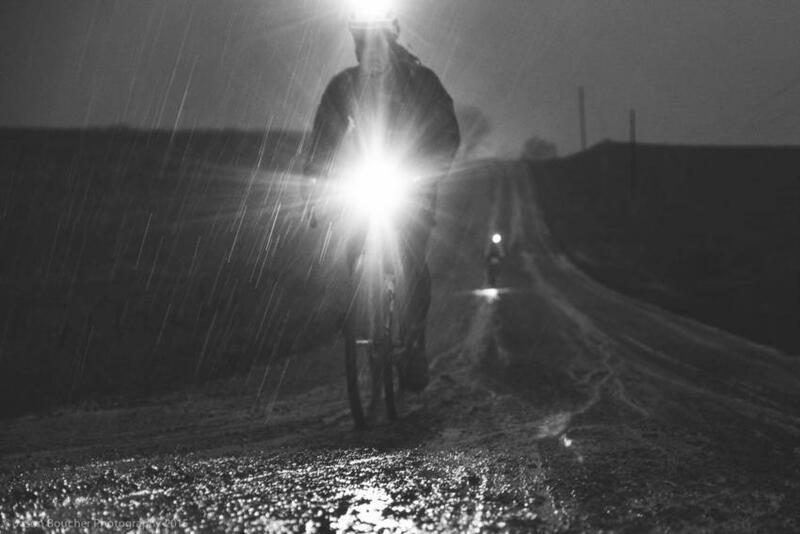 He mentioned all the fresh, deep gravel around Grinnell and the rains. Two other TIs have been called due to weather and there was one TI when no one finished. Even though 120 racers signed up in November, only 94 showed up. That night it rained. And it rained some more. 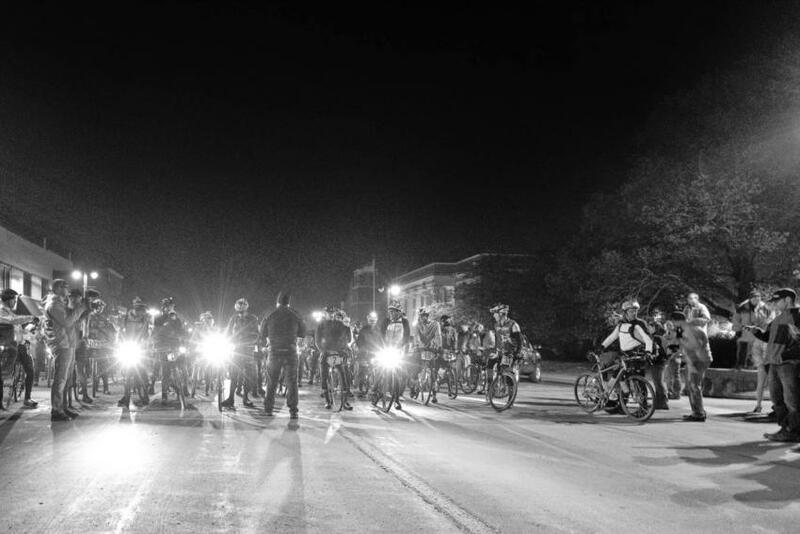 The race starts promptly at 4 am in from 'Bikes to You' in downtown Grinnell. There was no rain, but it was in the air. The temp was 38 degrees and wind was brisk and chilly. There were racers in short-sleeved jerseys and others with Winter boots and balaclavas. Most folks were on cross bikes, a few mountain bikes and two fat bikes. There were 3 female and 91 male racers. I chose smartly and wore my rain jacket with a wool base layer, tights, shoe/toe covers and water-proof gloves from the start. I figured it it rained, I would be money ahead. If it did not, I would eventually overheat and have to pull over to strip off some layers. We all lined up, Mark gave a few words, we gave him a round of applause and 30 seconds later, we were rolling down the street... It was about a 3 mile controlled roll-out... before we hit gravel and the race 'started'. As soon at my tires hit the gravel, you could feel them sink in. The road was super-saturated. I shifted a couple of gears down. There were two lines of racers. 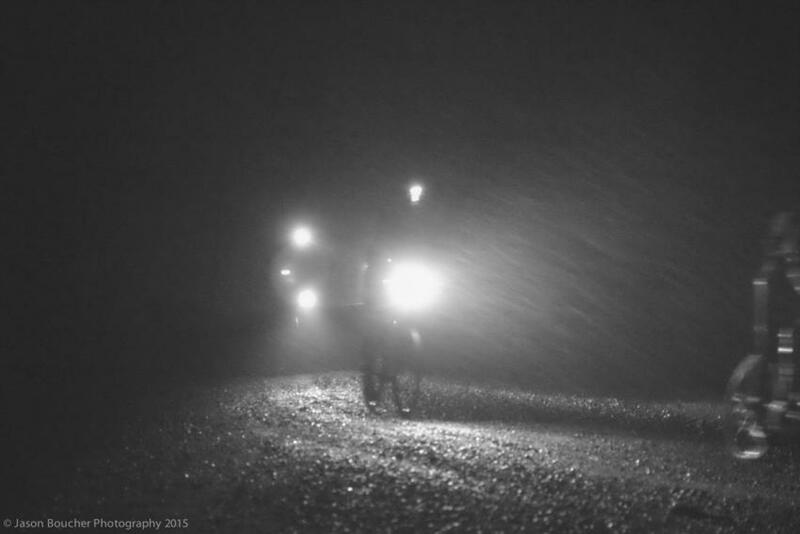 Lights from blinkies and headlights were everywhere as were puddles, dips and gravel piles. At some points it was like 'slinky' at rush hour where you have to stop really fast, then speed up really fast, an then repeat over and over. About 10 miles in, folks started to spread out and Andy and I started to move up in the pack. Mile 13... the mile I will never forget. This is when the rain started and the wind picked up. Riders were scattered on the side of the road putting on rain gear. Andy and I just passed right on by. 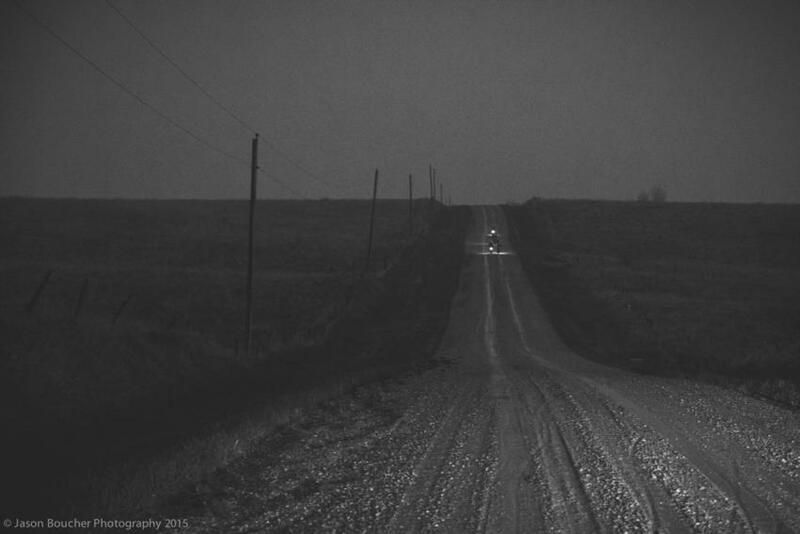 It was still pitch black out, and there were rivers of water along the sides of the gravel roads. There were a bunch of rollers so was climbing at 10-11 mph and going downhill at only 15-17 mph. The roads were really sketchy as the bike wanted to wash out and you could not take a hand off the bars to drink or eat without fear of losing control. We had a long stretch of side-wind and then an 8 mile stretch of head-wind. Right before we turned into the head-wind, I stopped to put some latex medical gloves over the top of the cycling glove and under my water-proof shells. I also downed a GU and some water. I could feel the water starting to seep in and that extra barrier really helps. Our next stretch was 10 more miles of monsoon-like side-wind from the other side. At this point there we were 34 miles in, riders were very spread out and we were riding between a couple packs of 3-4 riders each. The gravel will still super-sketchy and it actually let up on a rain a bit. We came up on a 1 mile stretch of Level B road at 34 about 3 hours and 20 minutes into the race. There was one tire-track down the middle for about 30 feet (before it veered off into the ditch) and some footprints on each side. This is where I noticed that there were not that many tracks which we guesstimated we were no further back than 15th place? I was kinda excited for the Level B. I had devised a harness where I could carry my bike with ease and was eager to try it out. Although walking versus riding still sucked, the harness worked superbly !! Sometime we could walk in the ditch, but other times there was a deep gully on one side and a steep hill on the other. The mud was slick and sticky. I lost one toe cover and right foot had at least 5 pounds of mud that worked its way into my shoe cover. There is a great shot of the Level B below. The Level B walk took the energy out of the legs, but it was light out and easier to see the road imperfections. We had 16 miles to go and only ONE hour before the cut-off. The roads were still mushy and we could only sustain 9-12 mph and even less up hills. Our spirits were dwindling and reality of not making it to the first checkpoint were setting in. We kept rollin' anyways. Around mile 45, Andy had a sidewall blow out. We booted the tire (twice) but and lowered his pressure to under 30 psi just so it would not blow out again. Well.. it did at mile 46.5. Mile 47 approached and we saw Joe Stiller's Sprinter Van with a few folks standing in the road. Andy rode on his rim to the van and we stopped to see what was up. Joe (who was on a fat bike) had broken a crank and called in his ride. As soon as we stopped the wind made us all hypothermic. Andy got set up for a ride and I made the decision to grab a ride too, cause I did not have anyone at the checkpoint 5 miles away... and we already missed the checkpoint cut off. So roughly 5 hours into Trans-Iowa V11, as a rookie, my 'race' was over. I was too cold and hungry to be too depressed. The warm van ride back felt great and thanks to the guy who shared his sandwiches with us! Thanks to Joe Stiller for the ride! Not only did WE not make the cut-off, but 93 other racers did NOT make the cut-off either! Unbelievable! Word traveled fast that only ONE racer made it to the cut-off with less than 5 minutes to spare. 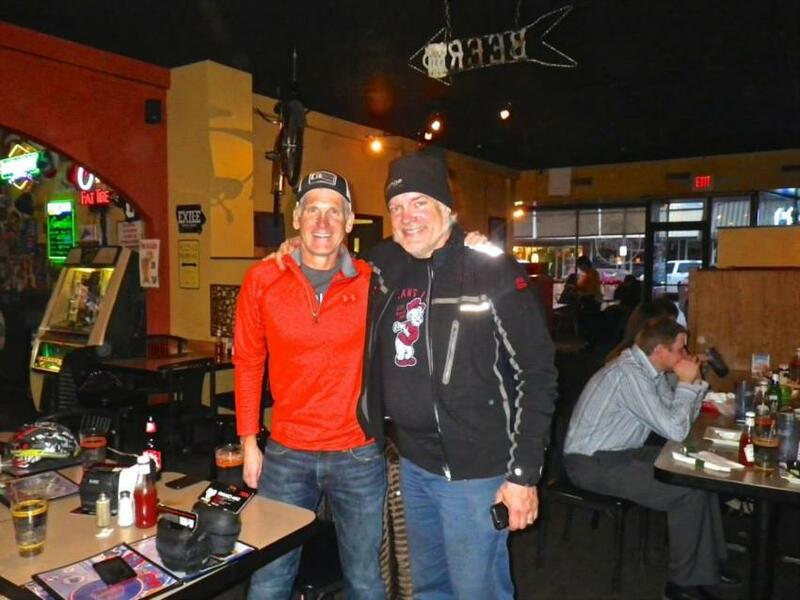 It was Greg Gleason (aka Highlander) who had won Trans-Iowa v10. The next guy arrived 10 minutes late and then a small pack was 15 minutes later. Most others turned around earlier after their dreams were shattered. Greg made it to mile 123 before it was over for him. Even though the weather ended the race for ALL of us, Greg was declared the winner of TIV11. Congrats Greg! It was the shortest Trans-Iowa to date. Don't Mess with Mother Nature - She will always win. No matter how good of shape you are in physically and mentally, the weather is always the wild-card. I feel like I packed a little too much gear, but given the weather, I would have used it all over the whole course. 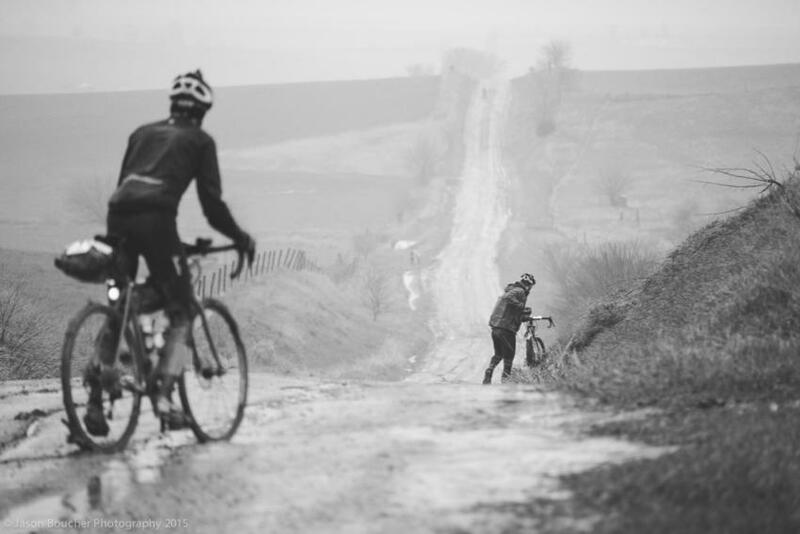 The harness - I'll never do a long gravel ride without a harness again. It was well worth it for the ease of carrying the bike. I was also able to take a full frame bag to keep gear at my fingertips and the weight distribution low on the bike. Wear rain pants if you got 'em. I had 'em, but did not want to stop to put them on. My legs were fine. It was the tights than allowed water to get into my shoes. My rain pants would have stopped that. As funny as it may sound, I bought some dish-washing gloves at Walgreens. I thought they would be good for warmth and water-proof-ness in a time of need and they packed up into no space at all. I did NOT take them. I wish I would have. Don't put shot-blocks in a plastic container. With the humidity, they get all sticky and won't come out of the damned container. The bike fit was spot-on! Thanks to Adam at Rasmussen Bike Shop for the head-to-toe bike fit! Have a beer or two the night before. It's not gonna wreck your performance! I did not get a chance to take any photos, but THANKS to these photographers, we've got something to look at! Jason Boucher - Rider #57, and the rest of the AWESOME black and whites!